How Does Ryzen Stack Up in Gaming Performance? Ryzen is AMD’s latest line of desktop processors, launching with a new motherboard socket and a dramatically different architecture. This architecture has made AMD a much better choice for gaming than they have been in some time, but is that enough to combat Intel’s market dominance? Ignore the prices in the image above – at the time of release, these two processors were both competing to be the best gaming CPUs that either company had to offer and were priced much closer together. Back then the 8350 was the pinnacle of AMD’S FX line, while the 3570K was Intel’s mid-range monster CPU. 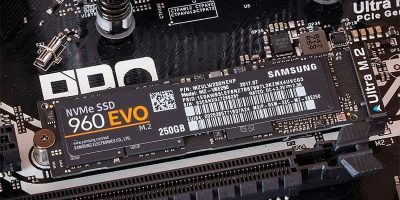 The 3570K’s sheer power, however, led Intel to market dominance, and that dominance has remained uncontested in the years since. 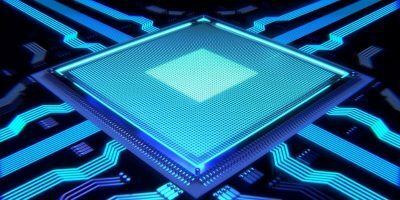 To understand why Ryzen is a big deal, it’s first important to understand a few basic truths about CPUs. Most important of these is that clock speed and core count alone do not determine a good processor. In fact, AMD’s last-gen FX lines were often up to eight cores but would fall behind Intel in gaming and productivity applications alike. 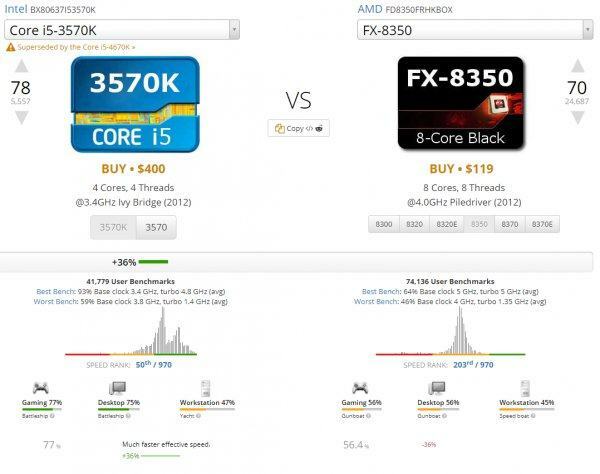 This is also illustrated in the image below – despite having more cores and a higher clock speed, the 8350 simply could not compete with the 3570K. Clock speed and core count are really only applicable for comparisons across the same architecture. For instance, all current generations of Kaby Lake Intel processors use the same architecture, and as you climb up from Pentium to an i7, clock speeds and core counts actually are a great way to compare CPUs to each other. The same thing applies to Ryzen processors. For a long time Intel has dominated the market thanks to significantly stronger single-core performance. This is easier to optimize around for gaming, so Intel processors have been the top pick for PC gamers everywhere for quite some time. 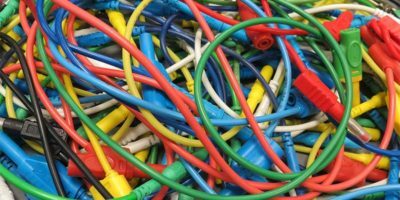 Fully utilizing quad (and octo) core systems is difficult, if not impossible, for most game engines. Because of this, strong Intel dual-core and quad-core processors have generally been the best options for gamers, but Ryzen is starting to change that. Ryzen has much stronger single-core performance than previous AMD processors and still boasts incredible multi-core performance as well. Because of this, Ryzen processors across the board are giving Intel a run for their money in terms of streaming and rendering performance. Games that are better-equipped to handle multi-core processors will also see improvements with Ryzen. But is the single-core performance good enough to compete with Intel? There’s a few Ryzen 3 processors out there, but the two most notable ones to speak of are the Ryzen 3 1200 and the Ryzen 3 1300X. The Ryzen 3 1200 is a competitor for the Intel Pentium line, but most especially the Pentium G4620. 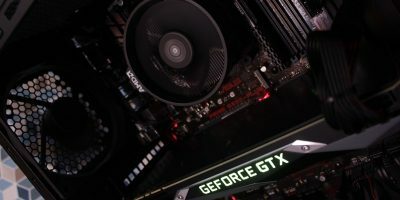 In gaming performance the two processors are closely matched, with the two processors taking various games by up to a five-percent performance increase. 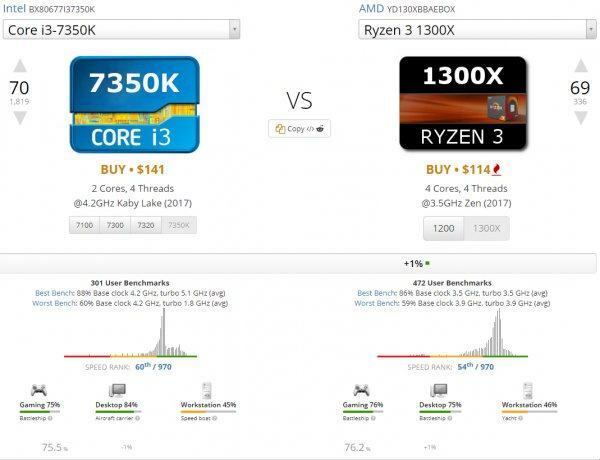 Meanwhile, the Ryzen 3 1300X is meant to compete with the Intel i3 line, but most especially the i3 7350K, a dual-core processor equipped with hyperthreading. The results here are similar: trading blows depending on the game but with Ryzen still having a respectable lead in rendering and streaming. In the case of the Ryzen 3 1200, it’s a bit more expensive than competing Pentium processors for what’s mostly the same gaming performance. 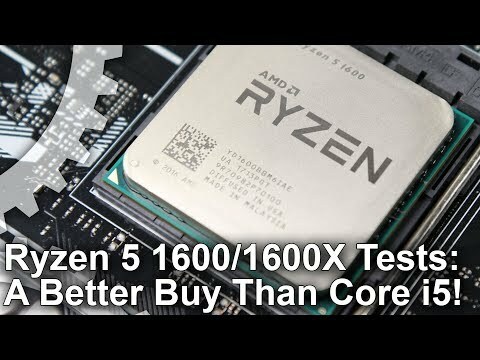 In the case of the Ryzen 3 1300X, however, it’s cheaper than the 7350K while still matching it in gaming performance. 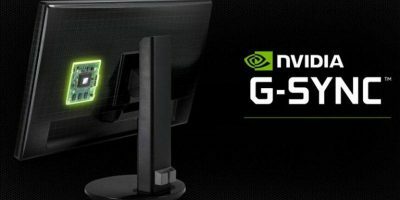 If gaming is your top priority and all you care about are your frames, I recommend either the G4620 or the Ryzen 3 1300X if you want the best FPS per dollar. If you want a more rendering-capable PC for cheaper than the 1300X, the 1200 is also a great option. Ultimately, the story seen in the low-end repeats in the higher-end. In general, the Ryzen processors will compete on par with their corresponding Intel processors, trading blows depending on the game and occasionally having slightly lower overall performance. However, especially with Ryzen 5 and Ryzen 7s, the higher core count and threads allows AMD to pull significantly ahead in heavy, non-gaming tasks like rendering video or streaming your gameplay live. In general, Intel Core processors will be slightly better for gaming, while Ryzen processors will be great for gaming but better for more versatile use when compared to Core processors in the same price ranges. That’s pretty much all there is to say. If you’re in the market for a new processor for a gaming PC build, I recommend going with Intel if it’s priced significantly lower than its competing Ryzen chip. Otherwise, just go Ryzen – not only will you enjoy basically the same gaming performance in most instances, you’ll also have a much more well-rounded system for doing other heavy tasks. 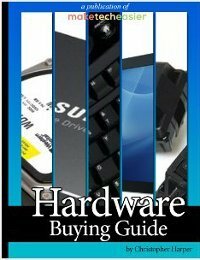 If you need help building a gaming PC, you can check out this ebook to get you started on buying PC hardware. If you need help with anything else or have any other questions, comment below and let us know! 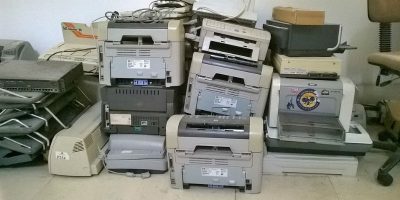 Will the Equifax Hack Change the Way You Protect Your Identity?